Votive stupas (symbolic reliquary mounds) were erected in great numbers by monks or laymen around major Buddhist shrines, particularly the Mahabodhi temple at Bodhgaya. Niches containing Buddha images on each side are enclosed by multiple rows of Buddhas. 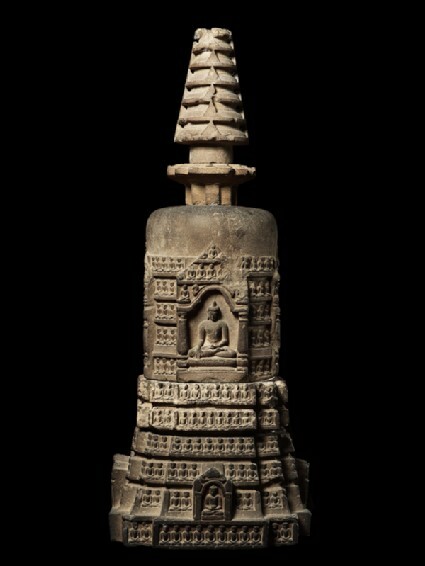 Model stūpas such as these are found in considerable numbers at Bodhgaya, the site of the Mahābodhi temple [see EAX.391], and at many other Buddhist monuments. They were placed there by monks or members of the laity, in the same way as the relief-steles depicting the Buddha, Bodhisattvas or other members of the Buddhist pantheon. In contrast to ex votos in Christian churches, which are usually presented in gratitude for answered prayers, the Buddhist equivalents were given as a means of acquiring merit not only for the donor but for his parents and, a phrase often recurring in inscriptions, all sentient beings. These miniature stūpas, presumably small versions of the large ones, are precious documents in tracing the evolution of the latter, which have almost all disappeared. Instead of the low, barely hemispherical dome, on a low platform, of the earliest stūpas [see EA1978.127], here the high stepped base, square in plan, supports a tall cylindrical section, only the topmost portion of which consists of a dome, its curved portion little more than a cap. The harmikā, the little platform fenced off by a vedikā, of the early stūpas has been stylized beyond all recognition; so has the parasol and its staff (chattrāvalī), now a thin truncated cone of seven compacted parasols. Small niches on the cardinal points on the base and larger ones on the cylindrical part of the stūpa, contain relief figures. Occasionally one of these is opened up, introducing a shrine element to the stūpa. Figures of the Buddha are placed in three of the large niches (the fourth is empty). He is seated in padmāsana [see EAOS.61] and the hands are in the mudrās (symbolic gestures) of meditation, preaching and “earth touching” (bhūmisparśa), the latter particularly appropriate since it recalls the Buddhe, seated under the Bodhi tree at Bodhgaya, “calling the earth to witness” that he had overcome the demon Māra who had sought to prevent him from achieving Illumination. While these figures may therefore stand for three great events in the life of the historical Buddha [see EAOS.3 and EAX.415], it is more likely, at this relatively late date when the doctrines of later Buddhism held sway in northern India, that they represent three of the Meditation Buddhas or Jinas (Dhyāni-Buddhas?) most apprppriately placed, since these essentially metaphysical concepts came to incorporate directional symbolism. Published photographs (see below) of almost identical miniature stūpas still in situ at Bodhgaya leave no doubt that the Museum’s example comes from these, particularly since these are of rather a distinctive type. 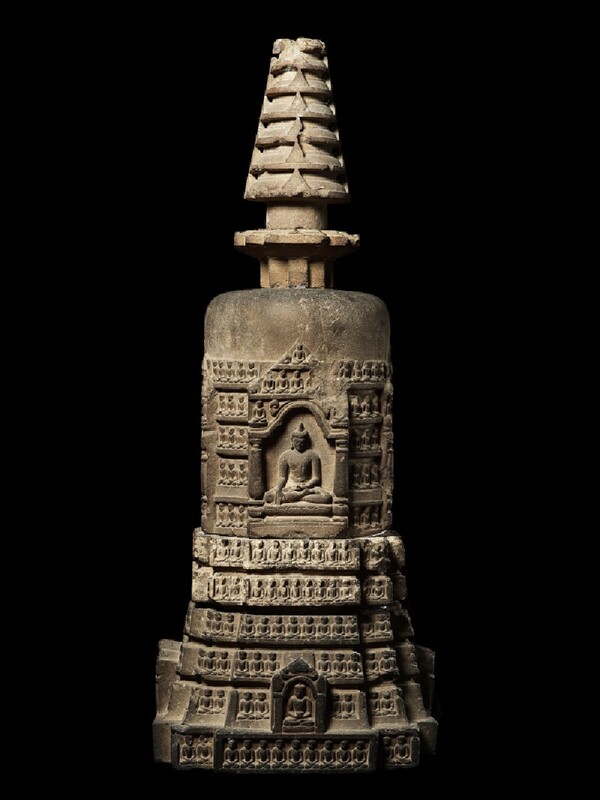 During cleaning and extensive “excavations” towards the end of the 19th century, hundreds and even thousands of these little monuments were taken away, many of them to Burma, the site having passed under the control of a Hindu religious organization. The Museum possesses several other miniature stūpas from Bodhgaya.